Is there a better way to celebrate than with a suckling pig? My sister recently graduated from college, and to celebrate in the style my family prefers we went to Amada in Philadelphia to dine, wine, and cheers the new graduate. We pre-ordered the half roasted suckling pig when we made our reservation. We started our meal off with some complimentary dishes. 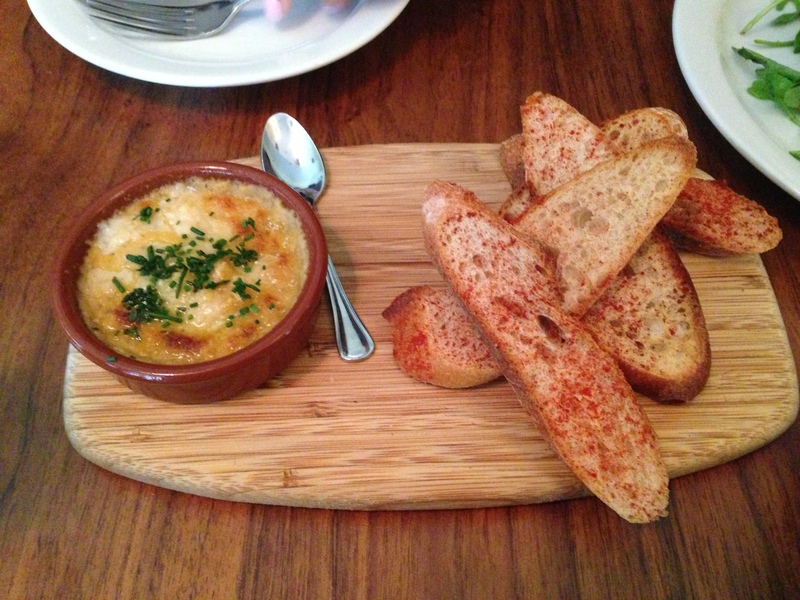 And onto the things we ordered…. 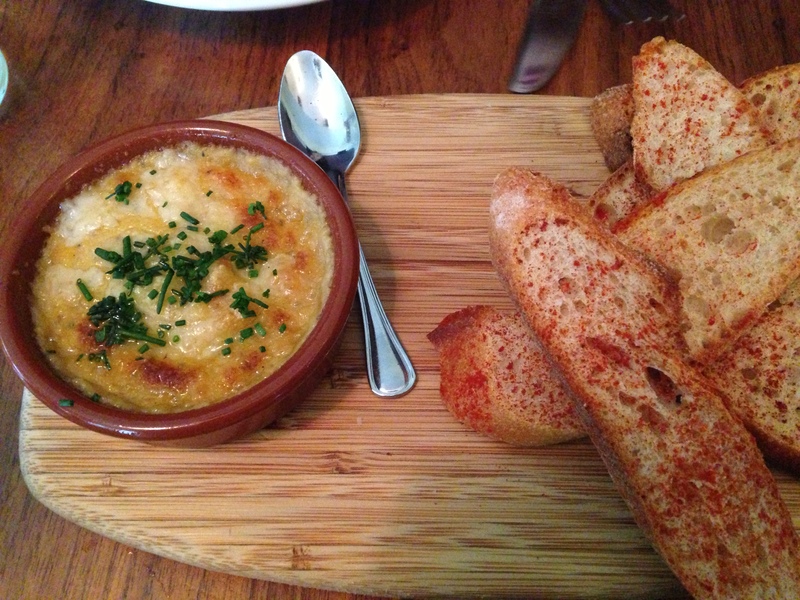 The Potato Tortilla Española – it was good, but I’ve honestly had better. The flavor and texture could be enhanced and perfected. 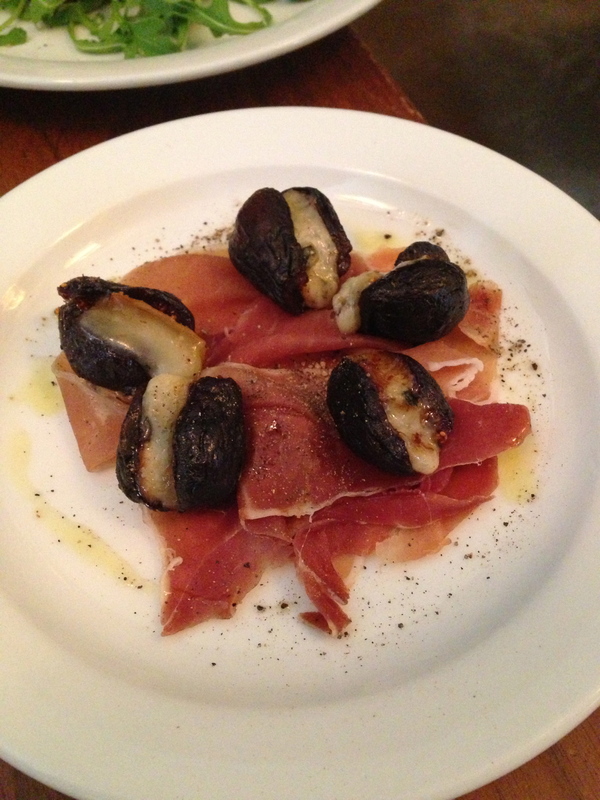 We ordered the Ensalada de Jamón and after receiving it almost immediately ordered another one. It was terrific. 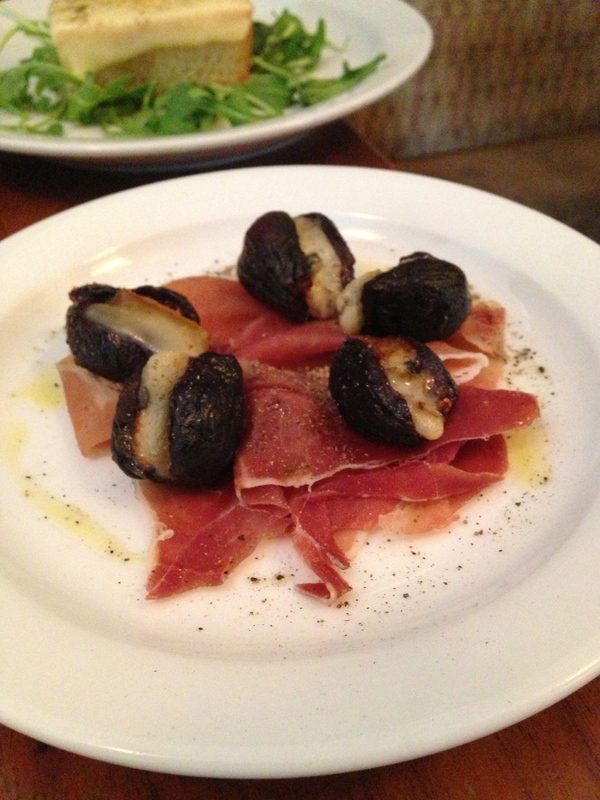 Ensalada de Jamón – serrano ham wrapped around figs, salad, cabrales, and spiced almonds. Obviously, we really like my sister because we went all out for her. The paella was delicious, though the dish itself was very shallow and I’m not sure how I felt about the seafood to paella rice ratio. 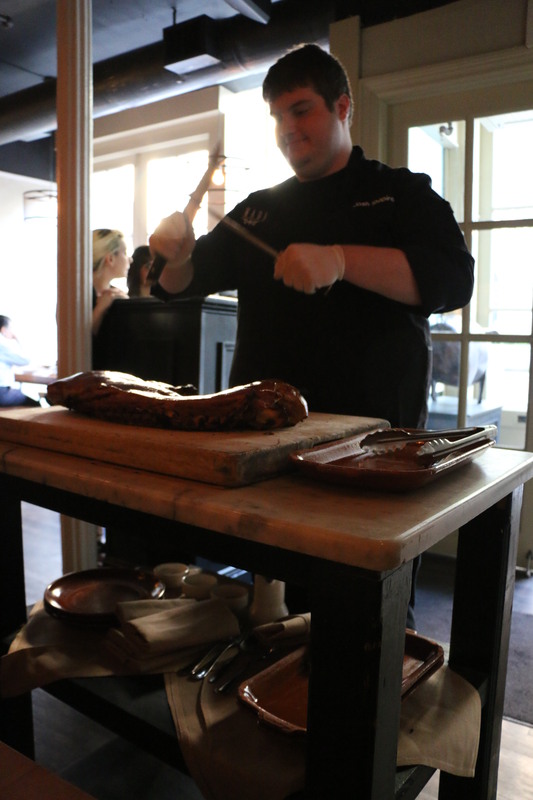 While we were polishing off our paella, our pig arrived. It was carved before us into perfectly portioned pieces of pork. I was already quite full at this point, but watching the process unfold before me persuaded me to stretch the walls of my stomach. Our pork came with sides (in order): Grilled Green Onions, Rosemary White Beans, Herb Roasted Fingerlings, Garbanzos con Espinacas. 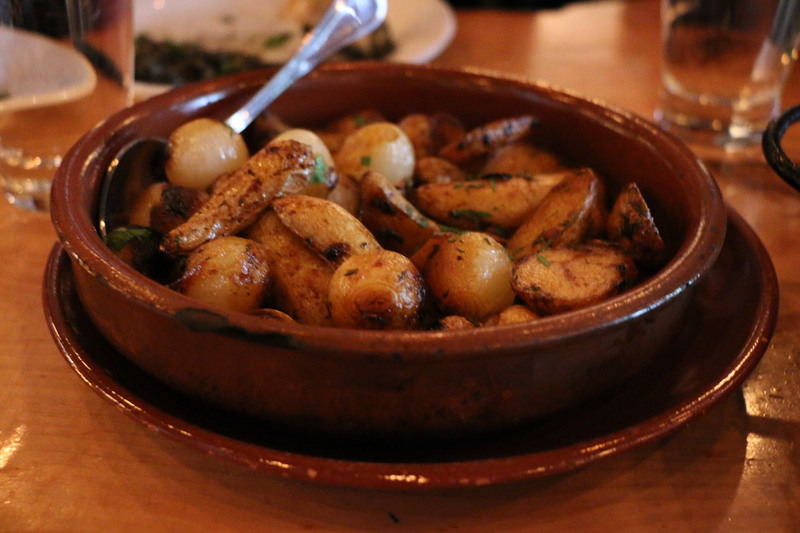 The fingerling potatoes and the grilled green onions were great. I found both of the beans to be over-salted, especially in conjunction with our pork. A meal for all of the meat-lovers out there to try. The pork was absolutely delectable. We had a significant amount of leftovers the next day and made bahn mi sandwiches with the pork for lunch. It was still delicious – perhaps even more so, because I was more hungry then. Many thanks to my parents for the meal, and many felicitations to my sister on graduating. I spent a few days last week in Philadelphia with my sister. Although the city may be known for its Philly cheese steaks, the City of Brotherly Love also has plenty of gourmet food to offer. I let my sister take me around town to try some of Philly’s finest (or phinest?) foods. I was excited to be back with my sister, and more specifically, back eating with my sister. We make quite the dining pair, and I can’t quite perfectly order, enjoy, and critique a meal with anyone like I can with my sister. The one unfortunate part of this trip is that I forgot my SLR camera. But alas, the iPhone photos will have to do. For a shopping break, my sister and I stepped into Tria, my mother’s favorite wine bar in Philadelphia. I love the simple decor and intimate ambiance of restaurants like Tria. My sister and I chose a few delectable dishes and had an enjoyable and relatively inexpensive afternoon snack. 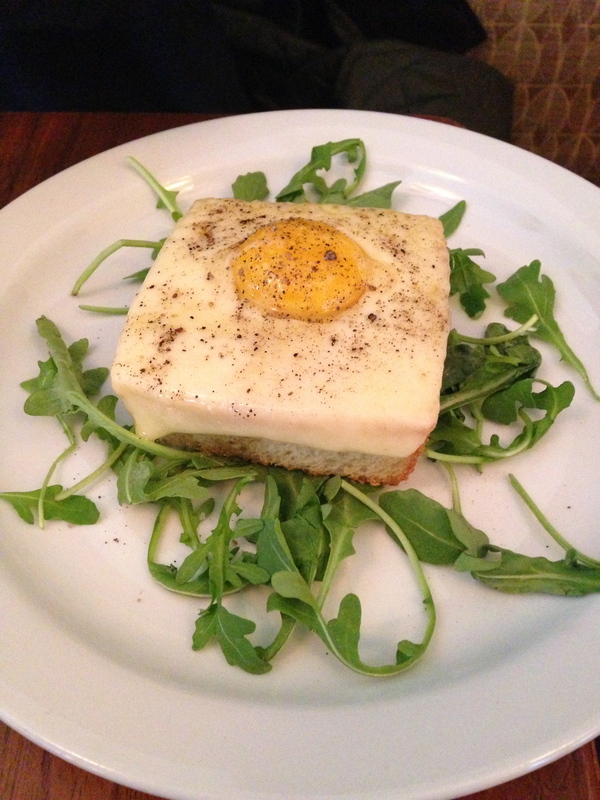 Truffled Egg Toast with Fontina Fontal. 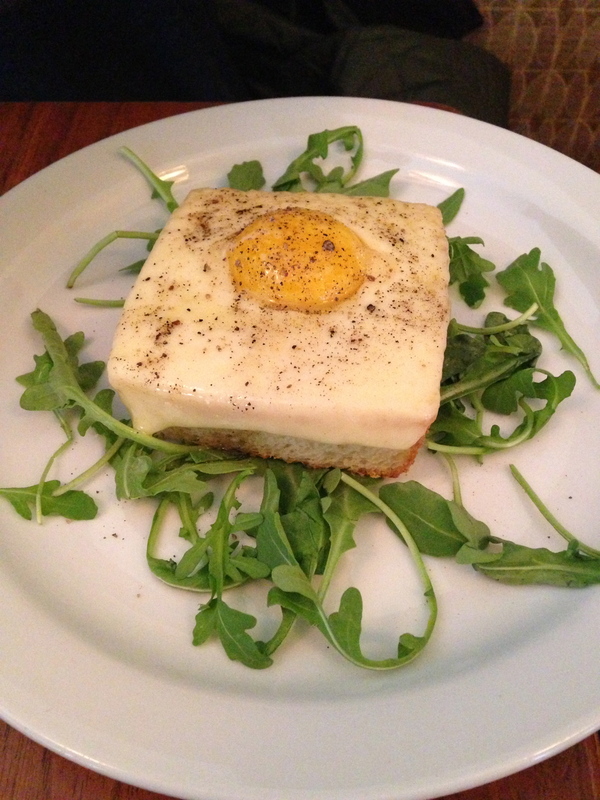 Although this dish was quite simple (basically a croque-madame without the ham), it was one of the tastiest snacks I have ever had in my life. 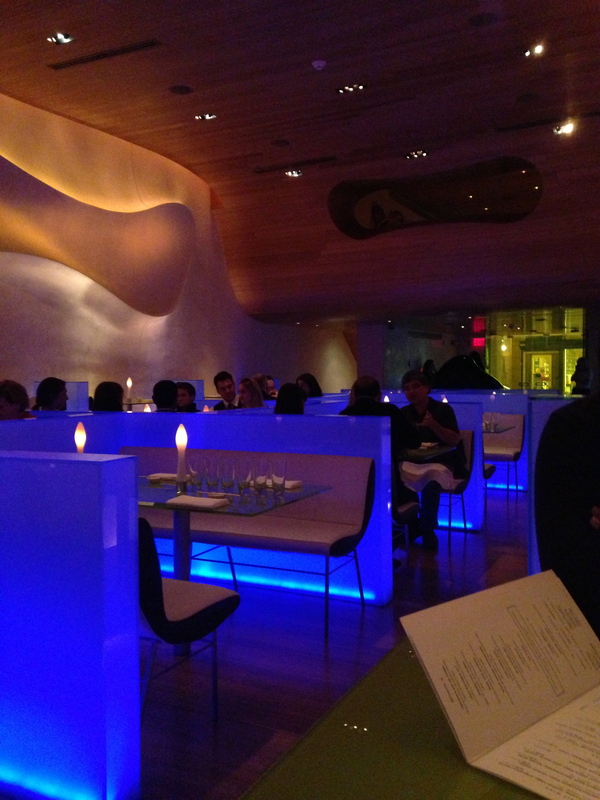 That night, we went to Morimoto. Coming from New Haven, I was excited at the prospect of some good sushi. 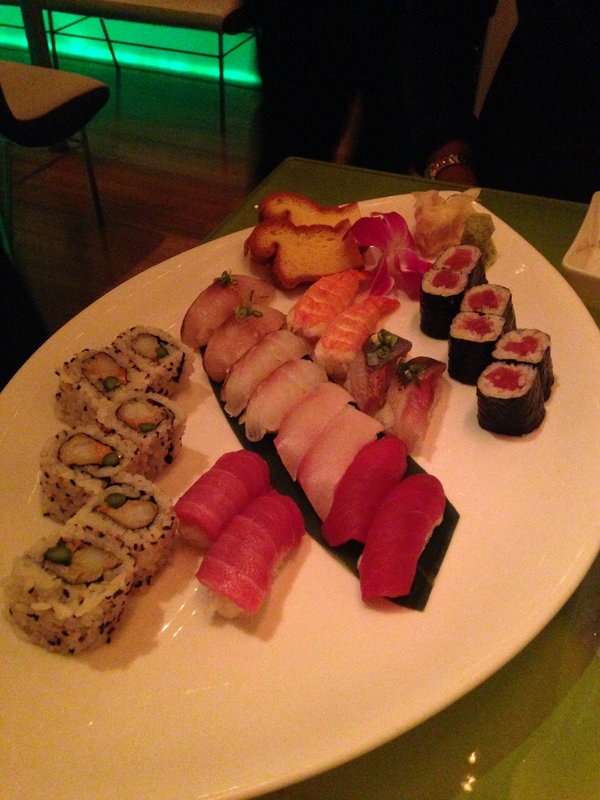 Morimoto did not let me down. 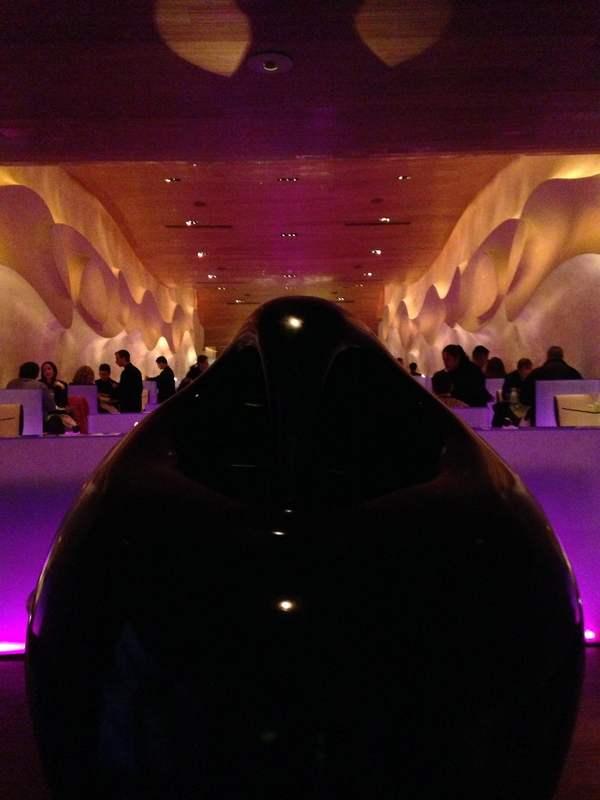 The design of Morimoto in Philadelphia is quite bazaar. The lighting is minimal and the white furniture and walls of the room are tinted by purple light. I told my sister, “I feel like I’m in the stomach of a whale.” That’s all I have to say. 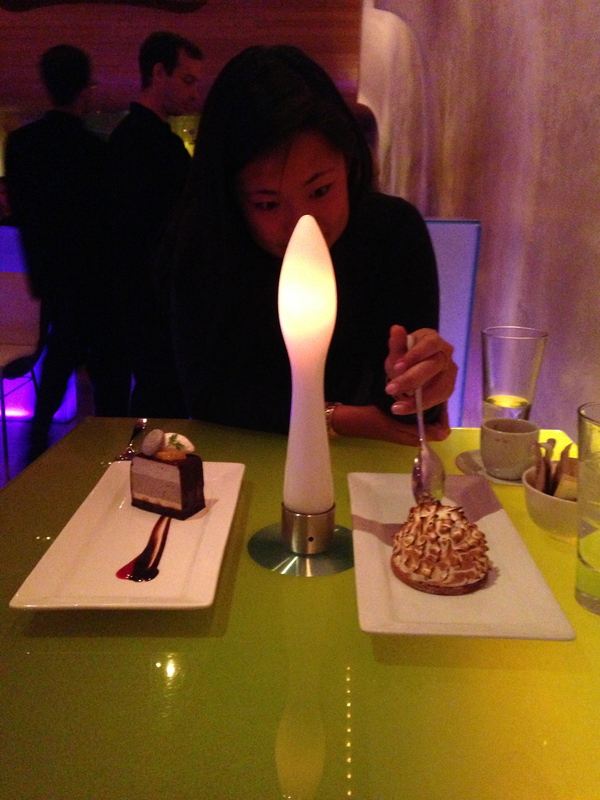 In addition, each table had the most phallic lighting object (candle alternative) built in to the table. I was not a huge fan, especially because it hindered my direct access to all of the dishes on the table. 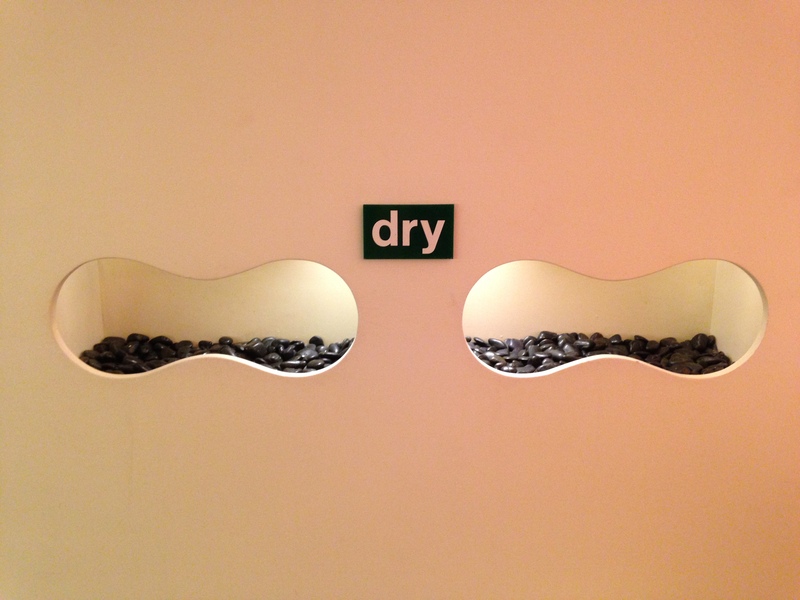 Always judge a restaurant by its bathroom décor. The food, however, was amazing. 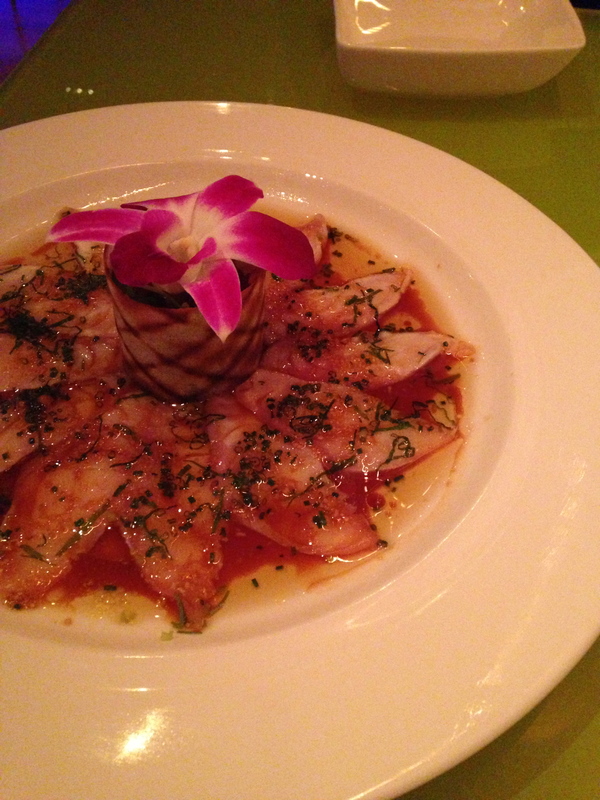 We started with the whitefish carpaccio – thinly sliced with yuzu soy, hot oil, and mitsuba leaf. For the main part of our meal, my sister and I shared the $85 chef’s combination. The highlights on the platter included the Shrimp Tempura Roll (seen farthest left), which had the best flavor and texture out of any tempura roll I have ever had. The addition of a crisp stalk of asparagus in the roll was surprisingly perfect. The kasetura, or shrimp pound cake, (at the top right of the platter) was also surprisingly amazing, and had a melt-in-your-mouth light texture that was delightful. The sushi all tasted quite fresh as expected. 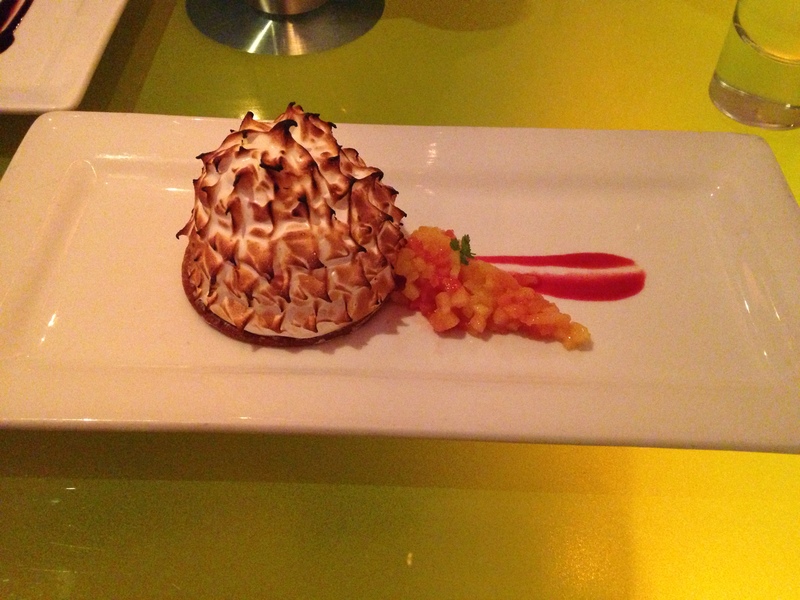 For dessert, we had the black sesame mousse cake and yuzu meringue tart. Both were quite good. 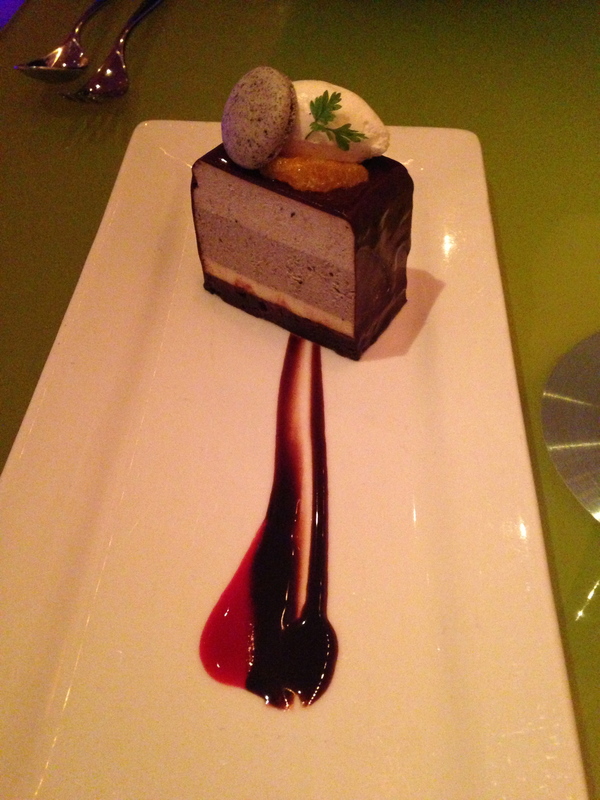 The taste of the black sesame cake was akin to a peanut butter-chocolate mixture. The yuzu meringue tart had a delightfully original taste. Until I’m reunited with my BFF (Best Food Friend) again!